Indeed, the food sector alone accounts for over 30% of global consumer energy demand and produces over 20% of global greenhouse gas emissions (FAO 2011).The urban population tends to be out of touch with agricultural production, and the city food culture increasingly moves towards fast food, processed foods, distributed by large centralised supermarket chains that are not rooted in the life of city neighbourhoods. Many consumers, especially, those with low incomes, eat too little fruit and vegetables because of the cost but also because it is not part of their culture and habits. Today, more than 50% of the world population lives in cities and by 2050, urban centres will gather more than 80%. Meanwhile, per capita calorie consumption in the EU27 exceeds daily requirements by 36% since the early 1990s. 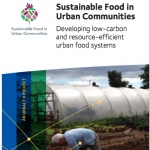 The current food system cannot meet this growing food demand of cities sustainably. It results in significant environmental impacts, but also social inequity in terms of access to balanced and affordable nutritious food in cities.